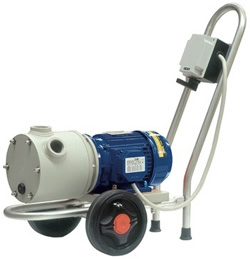 Hippo is a family of horizontal self priming pumps, versatile and reliable. Are designed to pump aggressive chemical liquids and designed to the smallest detail to maximize operative life and ease of use of pumping assembly and eclectic motor. Short coupled, with the wet end supported by the motor are compact and of overall small dimensions. Each pump can adopt different electric motors which allows to pump to the max. flow of the pump liquids with specific weight up to 2,00 kg/dm2. Electric motors are standard normalized IEC.